Please visit the top page of the project and see the interface below. 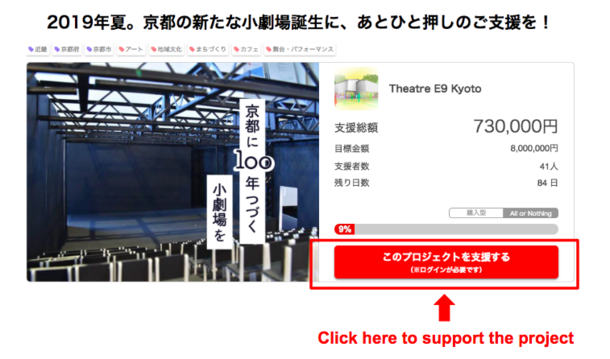 Click the red button to support this project. Next, you will see the interface below and be asked to create your account. 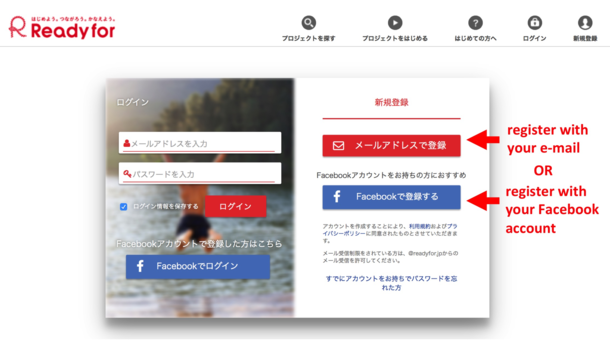 You can either register with your Facebook account or with your e-mail address. 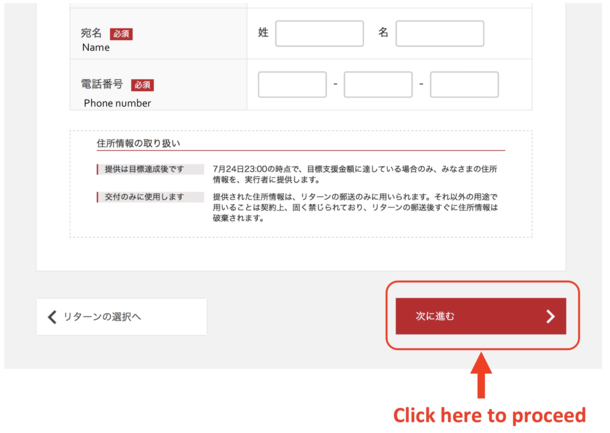 If you decide to register with your e-mail address, you will see the interface below. 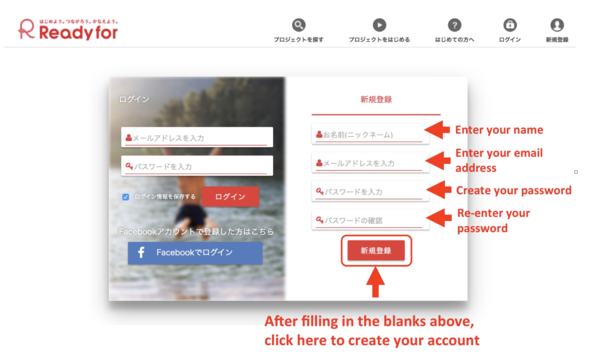 Please enter your name, e-mail address, and password, and press the red button in the bottom to create your account. 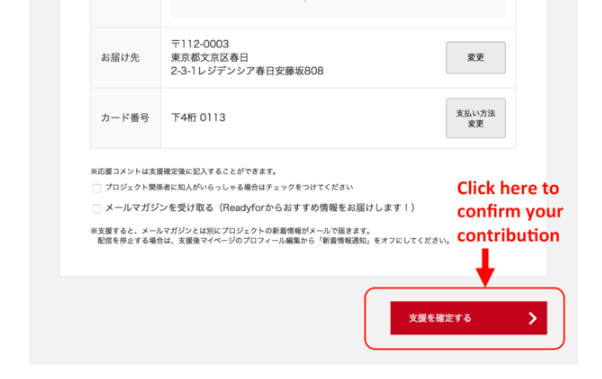 Once you click the red button, you will receive an email from Readyfor (no_reply@readyfor.jp) and you will be asked to verify your email address by clicking the first URL on the email. 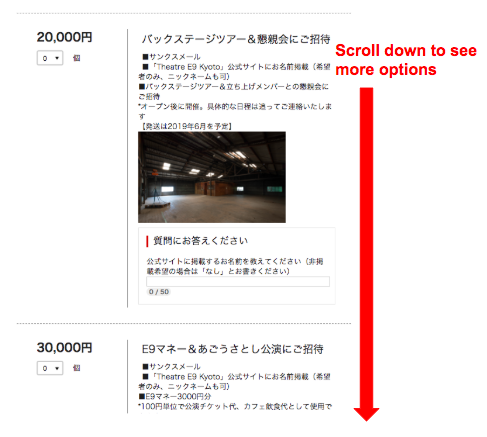 One you click the URL, you will jump to the interface below and now you can choose how much you will contribute. One you see the interface below, please choose how much to pledge. 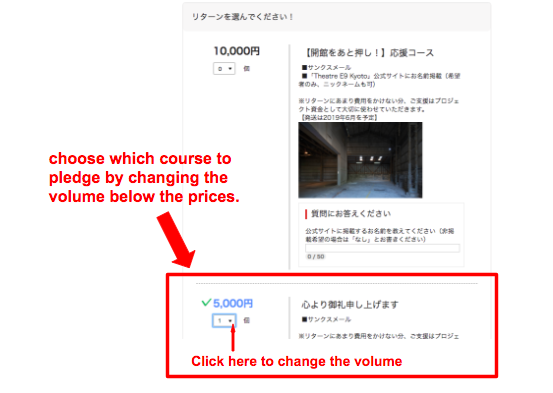 You can select from 9 different courses of 5,000 yen, 10,000yen, 20,000yen, 30,000yen, 50,000yen, 100,000yen, 300,000yen, 500,000yen, and 1,000,000yen contribution by changing the volume button below the prices. After you selected your amount of contribution, please scroll down the page and reach to the interface below. 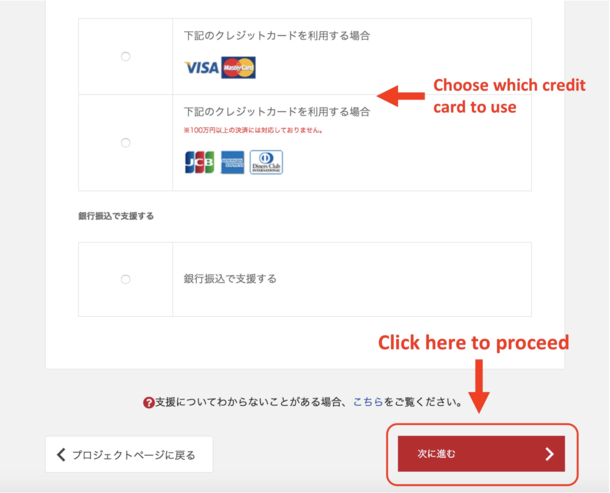 Please select which credit card to use and click the red button on the bottom right to proceed. Next, you will see the interface below and please enter your credit card number and card expiration date. 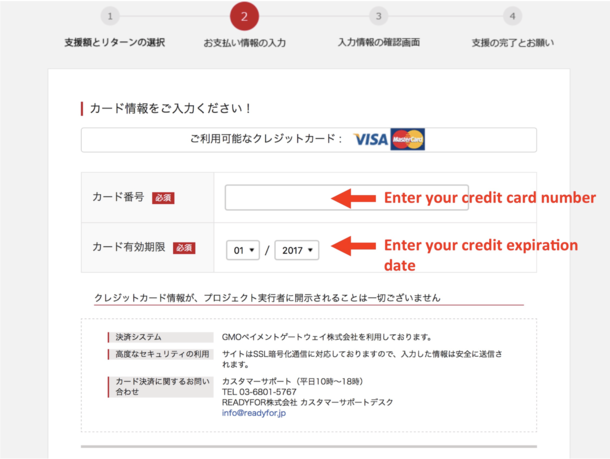 After you enter your credit card information, please scroll down the page and reach to the interface below. In this section, please enter your address so that the project members can send you “thank you gift” to you. 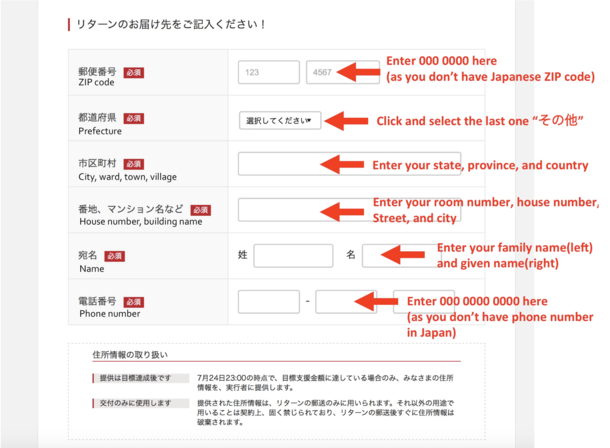 After entering your address, please click the red button in the bottom right to proceed. Next, you will see the interface below and you can check the total amount you pledged. 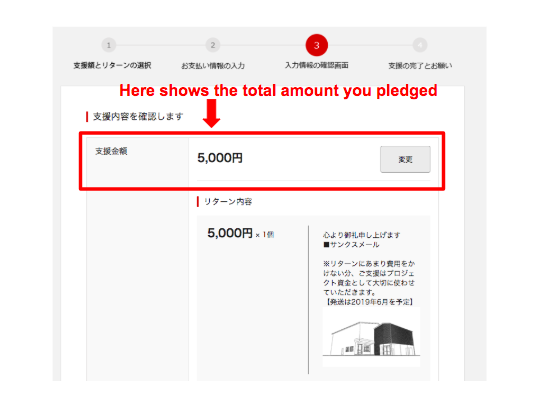 If you agree with the amount you pledge, please click the red button in the bottom right to confirm your contribution. Once you confirm your contribution, your donation will be completed and you will see the interface below. 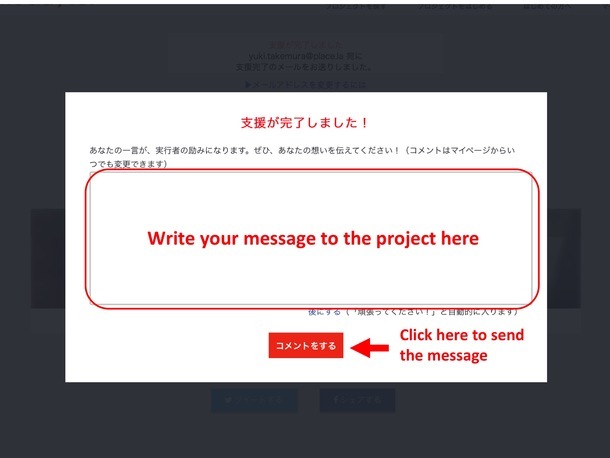 Please write your message to the project (the message will be listed on the project page) and send the massage by clicking the red button below the blank. Once you send the message you are done with your process to support the project. Thank you for your contribution! ※Any commuting expenses and accommodation are not included in this course. Please burden these at your expense.